1st Place Gem Award : John Dyer/Precious Gemstones Co. This competition for gemstone cutting receives entries from all over the world. It is considered to be one of the most prestigious gem cutting awards due to the reputation of Idar-Oberstein as a major center for designer gem cutting. There is only one category for professional gem cutters in this competition which is held only once every two years. Achieving top honors is very difficult. This year’s theme for the competition was “Light My Fire.” Each entry has to not only be beautiful and well-executed but also embody the theme. Gemstone design has first priority in the judging. The concept, realization of the theme, and quality of craftsmanship are also considered. Prizes were awarded in a ceremony held in Idar-Oberstein on November 27th, 2015. 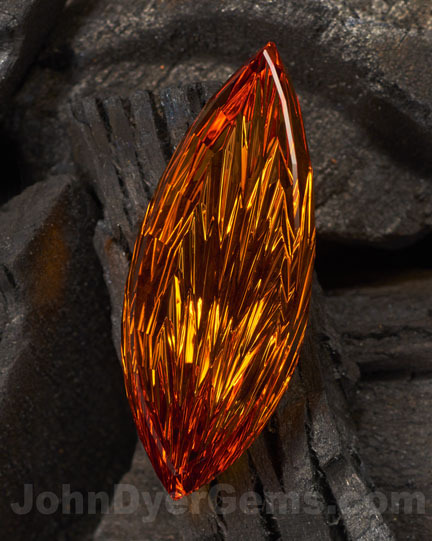 John’s first place winning gem is titled “Internal Fire” and was crafted in fine red/orange Brazilian Citrine weighing 88.17 carats. This is one of my favorite competitions, but the fact that you have to adhere to a theme makes it more complicated. You might have a perfectly beautiful idea for a gemstone cut, but it must go with the theme to win. The theme “Light My Fire” didn’t immediately suggest anything to me so I prayed, asking God for inspiration about what to cut. From there on it was an unfolding process. It seemed to me that an orange gem would go well with “fire.” With this in mind, I searched through my stock of rough and one deep orange citrine stood out. Once I had ground it clean, it was indeed a flame shape and so the process of cutting the gem was begun. In spite of having the flame shape it was still a challenge to decide what to do with the underside of the gem to make it look like fire. Then an idea came to me to execute a pattern that I had never done or seen before. This required an adaptation of my existing machinery and techniques. The award winning gem was also an experiment where I tested this technique and pattern for the first time. The result is a gem with a flame shape, but it also has little flame-shaped internal facets on the back which reflect light individually with varying intensities so that they look like flames shooting upwards as the gem is moved. "Here you can only engage in the use of superlatives." the fire springs up and spreads. but the single flame holds within it a burning fire! The first thing you notice about this gem is the shape of the single flame, then as you observe it closely you see that reflecting from deep inside are many small flames that shine as you tilt the gem. rising higher and higher as the fire burns more intensely! by the bright orange color of the Citrine and the reflected light from within.